One book on the living room table is a new one from WaterBrook Multnomah Press entitled The Dragon and the Turtle . 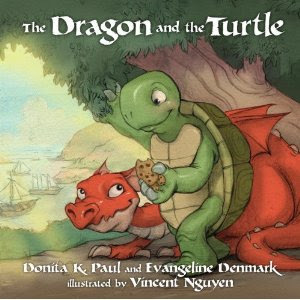 This tells the story of Padraig the Dragon who befriends Roger, the lost turtle. Roger has lost his home while out on a pirating expedition. Padraig befriends him and helps search out and find Roger's home by flying over the island. He is on the look out for a brown home that sounds like singing, smells like cookies, and tastes like strawberries (from the bushes out front.) The key verse surrounding this book is Proverbs 17:17 which says, "A friend loves at all times, and a brother is born for adversity." There is a small study guide after the story which prompts children to think about what it means to be friendly and helpful towards other people. The illustrations by Vincent Nguyan are perfect for the story. He gives the dragon a friendly look and feel, making both Padraig and Roger look like baby versions of the animals. This is appealing to my three year old who has recently dubbed all baby animals as being "so cute." At the very end of the book there is also a recipe for Chocolate Chip Snappers for anyone interested in a chocolate fix! Thanks, WaterBrook for the opportunity to check out this new book! Some time back I said that I was going to talk about Christopher Churchmouse and I haven't gotten around to it quite yet. A few years ago I stumbled across a copy of The Christopher Churchmouse Treasury and snatched it right up! 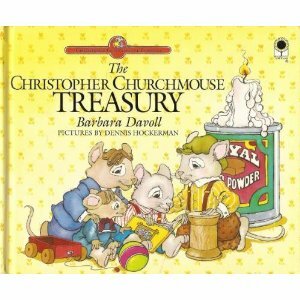 Growing up, Christopher Churchmouse was a bit of a celebrity in our house, given that my brother is named Christopher. Finding a cute little character to teach some moral and Biblical lessons no doubt delighted my mother to no end. I, of course, liked the name but also just enjoyed the mouse and remember reading these books with my brother when he was 4-6 years old. I picked up this copy of the The Christopher Churchmouse Treasury and tucked it away until just recently. Figuring Bookworm1 was about ready for them, I pulled out the book and I was not at all disappointed by his reaction to the stories. 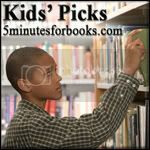 The Treasury includes 6 Christopher Churchmouse stories: Rainy Day Rescue, A Load of Trouble, The Shiny Red Sled, A Flood of Friends, A Short Tail and The Tattletale Tongue. Each one focuses on a specific Bible verse and shares a lesson through the Churchmouse interactions with each other and their friends. Written by Barbara Davoll and illustrated by Dennis Hockerman, these books originally appeared in the late 1990's. They are kind of hard to find these days, but I highly recommend them should you stumble across them. Davoll and her husband apparently have (and do?) operate a Christopher Churchmouse ministry to connect with children. You can learn more about that on their website if you'd like. In the meantime, if you want to check out what other books are littering our floors, our tables and every chair in the house - visit Reading My Library to see what we've been hauling home recently! Books constantly clutter our floors. It's frustrating at times but overall I consider it a good thing. These books all sound really cute. I haven't heard on any of them. You know I find fiction published by Christian publishing houses hit and miss, so it's good to read a positive review. Thanks, Carrie! The Dragon and the Turtle looks like one we'll have to pick up. My husband has enjoyed Donita Paul's "grown-up" dragon books, and this one looks like one my 4-year-old would enjoy. Thanks! Hey, Carrie! Thanks for bringing back sweet memories of reading Christopher Churchmouse with my children! He has been one of our favorites! We were big Christopher Churchmouse fans when my youngest was little. Unfortunately he lost some of his appeal to me when real church mice got into our missions closet, left little droppings everywhere, ate chunks of soap, and chewed up towels. Barbara H - LOL! Yes. Well, we've enjoyed quite a few mouse-y tales around here lately but I wasn't so enthused myself when we hosted a small mouse family in our home and had to chase them out! We won the battle, but it wasn't pretty. I much prefer my mice in BOOKS! I haven't heard of Christopher Churchmouse but we own a series of Christian books called "Mouse Prints: Journey Through the Church Year" that we like to read from time to time. They are helpful in explaining the seasons like Advent and Lent. I haven't heard of either of these, they sound great. Those are great illustrations, in each book. And yes, books create a lot of clutter here, too -- but it's OKAY!! Books are everywhere at my house, and I am so far behind! I also need some new bookshelves. These books look wonderful. I am sure my Best Girl would enjoy them. Thanks for sharing them! I like friendly dragons. And Christopher CHurchmouse looks familiar, though I can't place him in my memory. Our floors are cluttered with books too. I have a love-hate relationship with it!